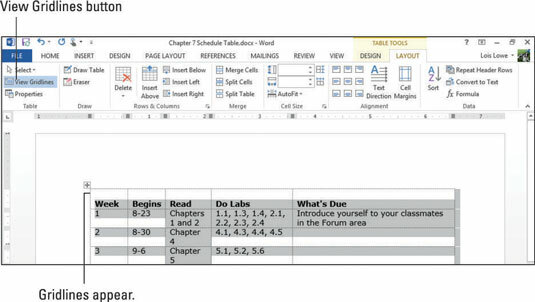 Gridlines can be displayed or hidden onscreen in your Word 2013 document (via Table Tools Layout→View Gridlines). Gridlines do not print, and when displayed onscreen, they appear as thin blue or gray dashed lines. You probably won’t see the gridlines in most tables because they’re covered by borders. By default, table gridlines have plain black borders. 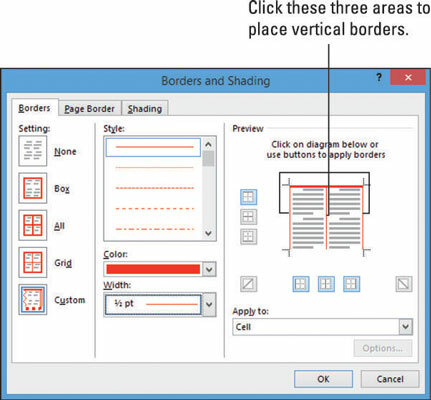 You can change the borders to different colors, styles (such as dotted or dashed), and thicknesses, or remove the borders altogether. 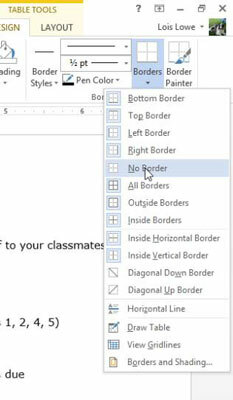 In your Word 2013 document, select the entire table you want to work with, and then choose Table Tools Design→Borders→No Border. If the gridlines aren’t already visible, choose Table Tools Layout→View Gridlines. Dashed lines appear for the table’s row and column dividers. Select the header row of the table and then choose Table Tools Design→Line Weight→2 1/4 Pt. Choose Table Tools Design→Pen Color and click the red square, or any other color, in the Standard Colors section. Choose Table Tools Design→Borders→Bottom Border. A red, or color you chose, bottom border with 2 1/4-inch thickness appears on that row only. 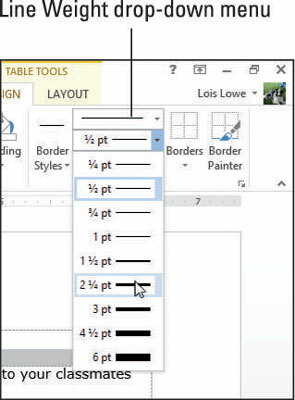 Select all the rows in the table except the header row, and then click the dialog box launcher for the Borders group on the Table Tools Design tab. The Borders and Shading dialog box opens, with the Borders tab displayed. The color you selected border appears in the sample for the top of the selection. From the Width drop-down list, choose 1/2 Pt. In the Preview area, click the areas where vertical borders might appear and then click OK. Turn off the gridlines again by choosing Table Tools Layout→View Gridlines, and then click away from the table to deselect it. The table now has a thick, top border separating the header from the rest of the table, and red vertical lines separating the columns.